Elle Gordon escaped the real world for a little while at Finn Lough, just outside Enniskillen. If you visit one place this year, let it be Finn Lough. This hidden treasure on the banks of Lough Erne is an idyllic escape that will leave you rested, relaxed and planning your return journey while on your way home. It’s just that ‘I want to go back’-able. But it is the unique glamping experience that makes this location one you’d better mark down on your bucket list. 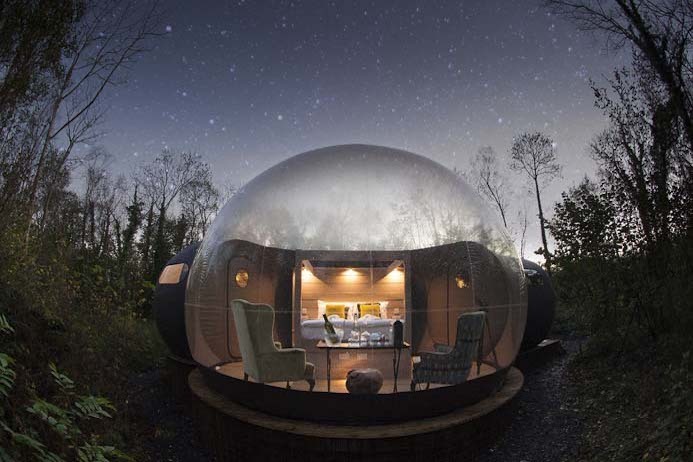 Finn Lough offers bubble dome accommodation which is exactly how it sounds – you stay in a bubble. Sleeping beneath a ceiling made up of stars has to be one of the most unique experiences that anyone could hope to experience and the fact that it is right on our doorstep is a bonus. The forest domes have 180 degree transparent walls allowing you to immerse yourself in your surroundings and soak in all the beauty of nature. Imagine stargazing while lying on an exquisitely comfortable bed, or ditching setting your alarm clark and just letting the light of the morning sun wake you? It’s divine. And if you can tear yourself away from being happily ensconced in your four poster bed, you can slip into a deliciously fluffy robe, sip on a Nespresso, and wait for your complimentary breakfast to arrive, piping hot and delicious. But although a fabulous reason to visit, this quirky accommodation is just one of the many attractions that Finn Lough resort has on offer. Their spa is without equal to any other experience I have had so far. Aptly called The Element Trail, it is described as a journey for the senses and it did not fall short in delighting myself and my companion. So much so that we had to steal ourselves from booking in for a second time and try to focus on the fact that there was a lot more equally fantastic activities we wanted to fit into our stay; but it was a tough decision, we loved it so much. This two-hour experience combines traditional therapeutic experiences with bespoke design in forest surrounds. After a quick induction, you follow the trail (dressed in a comfy robe… what else?) and experience different rituals as you move through. From a oat bath, traditional Finnish sauna, aromatherapy sauna, salt-scrub station and hydrotherapy pool, you might have arrived a frazzled human, itching to check your phone and wondering how on earth you will manage two hours roaming a forest, but my god, you will be powerless to resist as the worries and stresses of the outside world tumble away, leaving you transformed into a serene and relaxed version of you. A not to be missed moment is at the Finnish sauna, where you can take a little dip into the lake off your own private jetty! If switching off is simply not your bag, you can still work up a sweat, using the provided mountain bikes to cycle the 3km of woodland trails on your doorstep. Or get yourself on to Lough Erne in one of the resort kayaks to explore the vast lake. You might even spot some wildlife while out there… another delightful facet to what this wonderful resort has to offer. After all that activity you are sure to have worked up a healthy appetite, and you will not be disappointed by the stunning food at the resort restaurant, lovingly prepared with quality produce, much of which is grown in Finn Lough’s own polytunnel and also sourced from local suppliers and farmers. And given the resort lies on the shores of Lough Erne, ordering the fish is always going to be a smart decision. It is an unforgettable dining experience and you will find yourself wishing it didn’t have to end (it really is that tasty). And if you are still looking for some more R&R why not enjoy an after dinner drink in the snug bar… a pocket-sized bar adjacent to the restaurant. Or if enjoying a sunny evening, wander your way down to Sundowners bar and sip a cocktail beside the fire pit while drinking in the breathtaking views of the lake. Looking for heaven? Finn Lough is a slice of it.